A resident of Delaware claims that the popular shingles vaccine, Zostavax, caused him to develop severe problems with his eyes and vision. Leroy Crawley filed his product liability lawsuit on January 3, 2019 in the U.S. District Court for the Eastern District of Pennsylvania, where it joins other Zostavax lawsuits pending in the multidistrict litigation (MDL) 2848 before Judge Harvey Bartle III. The makers of Zostavax, Merck, introduced the vaccine in May 2006. It is a single-dose injection of live varicella zoster virus. Like all vaccines, it’s intended to work by triggering the immune system to produce antibodies to the virus. Live virus vaccines are supposed to contain a weakened version of the virus that does not threaten the patient’s health. However, lawsuits filed by patients who allegedly experienced complications to the shingles vaccine claim that the virus in Zostavax is under-attenuated, or not weak enough. 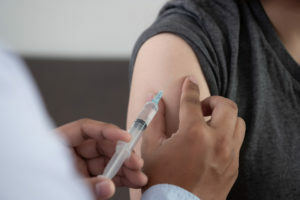 The virus in the vaccine allegedly causes the dormant shingles virus in the body to reactivate, which can cause the patient to develop shingles. This particular vaccine has also been linked to other serious complications, including vision problems. According to the latest Zostavax lawsuit, Leroy Crawley received a shot of Zostavax in April 2017. Within a month, he allegedly began experiencing sudden and severe headaches. These were accompanied by shooting pain and tingling in Crawley’s right eye. The plaintiff was also diagnosed with sudden horizontal bilateral diplopia, which means that he experienced horizontal double vision in both eyes. In addition, the plaintiff was diagnosed with sixth nerve palsy, zoster ophthalmia, and hypertropia of his right eye. Sixth nerve palsy, also known as abducens nerve palsy, is a disorder characterized by the dysfunction of the cranial nerve. This damage inhibits the proper functioning of the muscles that control eye movement. Patients with sixth nerve palsy commonly suffer from double vision, headaches, and pain around the eye. Leroy Crawley’s lawsuit joins a growing number of complaints that have been filed by plaintiffs from all around the country. Like Crawley, the other complainants allege that the defendants developed an unsafe vaccine with a virus that was not sufficiently weakened. They claim that the defendants failed to provide sufficient safety warnings to patients and doctors about the potential complications, such as the risk that the shingles vaccine could result in shingles. Since the allegations and statements of fact are similar across the different lawsuits, the U.S. Judicial Panel on Multidistrict Litigation (JPML) moved to centralize the drug lawsuits. The multidistrict litigation consolidates similar cases in order to streamline the litigation process and conserve the resources of all involved parties. MDLs are not the same as class action lawsuits in that all plaintiffs still retain their right to an individual trial by jury, and the outcome of one trial is not binding on the other cases. Following a lengthy discovery period, it’s expected that a handful of bellwether cases will be selected. These initial cases to go to trial will enable the involved parties to gauge jury reactions to testimony and physical evidence. As the pretrial process moves forward, it’s likely that additional Zostavax cases will join the MDL.